Although student affairs practitioners play a key role in student learning, few are familiar with learning theories, the design of experiential education, or pedagogical theory. 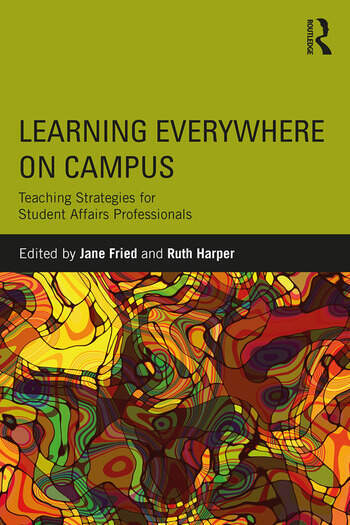 This edited collection describes programs in which student affairs professionals work independently or in collaboration with academic faculty and community partners to create more intentional and consistent approaches that enhance student learning. Examples, models, and case studies throughout the chapters make the theories and ideas specific and practical. Exploring educational opportunities in and outside the classroom, such as peer education, leadership development, life and career planning, civic engagement, service-learning, and study abroad, this book provides both theories and pedagogical frameworks for organizing and integrating the entire institution to promote and support learning. Drawing on multiple perspectives, Learning Everywhere on Campus shares the interventions and strategies necessary to help students learn new information, acquire skills, and understand the value of this knowledge in constructing their sense of purpose and self in the world. Chapter 8: Pedagogy: What is That? Jane Fried is a consultant to colleges and universities in faculty development and student affairs, and Professor Emerita at Central Connecticut State University, USA. Ruth Harper is American Indian Graduate Cohort Coordinator and Professor Emerita at South Dakota State University, USA.